Editor’s note: Jason Miller is a finalist for 2018 Content Marketer of the Year. We’ll share insight from CMY finalists in the blog before the winner is announced at Content Marketing World in September. Less than five years ago, social media giant LinkedIn wasn’t the top result for searches related to LinkedIn for marketing. Sites that covered social media best practices, such as Social Media Examiner, outranked it. Using a progressive content strategy built from a single type to a symphony of multimedia jams, the LinkedIn’s Sales and Marketing Solutions group claimed its search spot and developed a healthy following along the way. As head of content and social media marketing for the group, Jason Miller orchestrated it all, and earns a 2018 Content Marketer of the Year nomination. Taking a spin through his set list may inspire hits of your own. A collection of “big rock” content assets – in-depth projects that require more time, resources, and budget ­– helped LinkedIn own key topics. 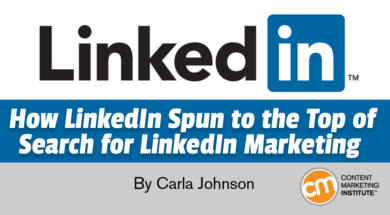 The team’s first smash hit came in 2013 with the Sophisticated Marketer’s Guide to LinkedIn. Updated yearly, it has now been downloaded more than a million times. The guides have been translated into six languages. From this base, Jason and team spun off several hundred derivative tracks, including infographics, mobile downloads, blog posts, SlideShare presentations, webinars, and influencer blogs. Since the series launched, the global content team backing Jason has helped expand the Sophisticated Marketer brand across regions, subjects, topics, and content formats. The Sophisticated Marketer downloads provided a base of success to spin many variations on the theme. Guests such as Seth Godin, Tamsen Webster, and LinkedIn CMO Shannon Brayton attracted the most attention. Altogether, the 70 episodes he’s produced to date have scored 150,000 downloads from 117 countries. The podcast has been featured in LinkedIn account-based marketing campaigns and live events (including episodes from Cannes Lions, Festival of Marketing, and Advertising Week NYC and London). Jason sources all guests organically, and the podcast is booked two seasons ahead. Jason and team launched this print and digital magazine as a test with a U.K. edition in October 2017. 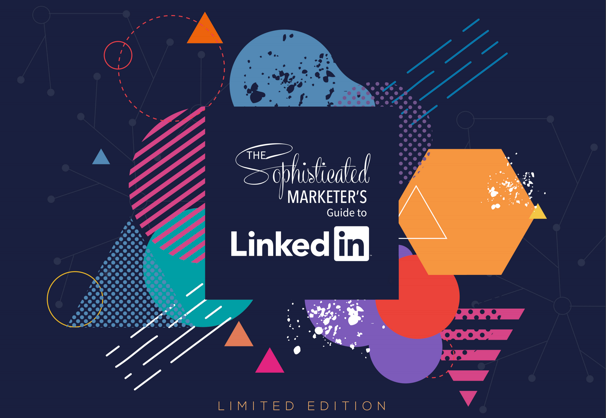 Billed as a magazine “for B2B marketers, by B2B marketers – with a little help from rock stars, psychologists, social media gurus, and more,” the 80-page issue included the best content from the LinkedIn Marketing Solutions blog. The first issue hit enough goals to merit a North America version (January 2018) and global edition (May 2018). Its subscriber list hit 5,000 and continues to grow. Each of these multimedia master classes in marketing takes a deep dive into a single aspect of LinkedIn B2B marketing. The sessions include infographics, case studies, videos, guides, and cheat sheets and have attracted 15,000 visits since the series’ November 2017 launch. Creative inspiration can come from anywhere: an LP record sleeve, a great band, a TV show. And it’s just as applicable to B2B as any other type of marketing. Covers for The Sophisticated Marketer’s Guide series take design cues from classic albums. The podcast and magazine are filled with inspiration from writers, musicians, filmmakers, and more. And the idea for B2B Dinner for Five, a video series based on a party with B2B marketing experts, came from the Dinner for Five TV show developed by Jon Favreau. Jason hosts this unique show, which takes on the key issues in marketing over three courses of unguarded conversation, with behind-the-scenes stories, provocative opinions, and secrets viewers wouldn’t get from any standard interview. The pilot episode, released on April 5, 2017, debuted with a special, invite only virtual live premiere where the audience could ask the dinner guests questions. Taking a page from the Hollywood playbook, Jason created several teasers and trailers to help build the story and create buzz around the world premiere and official launch. Jason and the team split each of the dinners into several “courses” and released them at regular intervals to increase interest. This approach also helped the team repurpose the video content by publishing natively to Twitter, Facebook, Instagram, Snapchat, and, of course, LinkedIn. Each episode also is posted to the LinkedIn Marketing Solutions blog, and the campaign serves to promote the blog, and LinkedIn itself, as a source for marketing insights. The team used Vidyard to host the videos and track results, then published the series on YouTube. Over three months, the series generated 12,500 total video views. It also landed on the charts with 7,600 blog views and 1,600-plus total social shares. The series earned a place in the 2017 Marketing Week Masters Shortlist (B2B) and was a runner-up for The Drum Awards. You can see the roots of many of the Sophisticated Marketer’s ideas in Jason’s pre-LinkedIn career. He started down the content marketing path as an entertainment writer, then handled the development and promotions of alternative artists for Sony Music Entertainment for more than a decade. During that time, he watched the music industry implode as it fought against looming digital competition before he took his first stage dive into the digital marketing crowd with social media and content positions at Zoomerang and Marketo. Outside of work, Jason moonlights as a concert photographer. But he’s clearly comfortable in front of the camera and live audiences, too. LinkedIn created a global evangelist role specifically to let him tap into these skills. Acting as front man for the LinkedIn brand and message, he spoke at 41 events in 2017 and drove over 100,000 organic engagements for LinkedIn. HANDPICKED RELATED CONTENT: Your Brand Needs a Point of View, But Do You? There’s no doubt Jason and team earn accolades within LinkedIn. Their combined media efforts have increased traffic to the Europe, Middle East, and Africa (EMEA) blog many times over and given people a reason to stay around – time on page is up 134%. Still, Jason keeps in mind that to get those results, there has to be something in it for the audience.